This comparative tutorial aims to make the bridge between wxWidgets and Swing to allow for Swing developers to use their experience to learn the toolkit. Unlike other tutorials that assume some familiarity with C++ GUI toolkits, it focuses on aspects that might be tricky or unusual to developers accustomed to Swing, deliberately bypassing distracting or repetitive instructions. Once the differences are digested and the basics are grasped, wxWidgets will become familiar and you will be able to proceed on your own without problems. While in college, I've played with C++ driven by pure curiosity, reimplementing data-structures to learn the basics of the language. However, there was a frustrating aspect about this exploration, as the results of my efforts were mere kid-play compared to what I could do in Java at the time. Moreover, data-structures exposed me to only a narrow subset of programming problems compared to what one usually finds while developing non-trivial GUI applications. Wherever I looked for the source code of a GUI application written in C++, the code would seem alien to me. I shied away from C++ for years until about a year after my graduation, when I was invited for a C++ project that used wxWidgets as the GUI toolkit. Having wxWidgets as my first real C++ "programming canvas" taught me that I learn much more when I'm doing something useful with what I'm learning. This reward is encouraging and leads to more exploration, which leads to more rewards, ad infinitum. wxWidgets may very well be the difference between knowing something of C++ or nothing at all for developers who would never consider learning the language without being able to create GUIs with it. If you are inexperienced in C++ and if you never considered developing a GUI application with it, wxWidgets might give the momentum you need to explore more features of the language, as well as opening your mind to the advantages of C++ when it comes to desktop applications. You may change the setup as you wish, but you will need to know what you are doing. This tutorial does not require advanced C++ skills, but if you feel you need to put yours in shape, this website is the best I know for this purpose. Note: if your wxWidgets is properly installed and configured, you can skip this section. The first thing you need to do is to make sure wxWidgets is properly installed and configured. You can easily check the status of your installation by compiling and linking the hello world found on wxWdidgets' website (the compile and link command is right at the bottom). Please don't try this on your IDE at this point because it might introduce path configuration problems. If it does not compile or link, something might be wrong with your setup. You might want to try the wx-config --cxxflags and wx-config --libs commands to see if they output anything. I must admit I had a tough time using wxWidgets for the first time on my machine because the automated installation provided by my Ubuntu did not install it correctly. A manual installation solved everything. If you need to compile wxWidgets as I had, the instructions that come with the sources are very clear and should present no problems to get going. You should look for support on Google or support forums if you still have problems at this point. Now the project is almost configured, but you still have to decide whether you will put all headers and sources in separate directories or not. If you choose the former, be sure to include the headers directory in the list of include directories (C/C++ --> C++ Compiler --> General in the Project Properties dialog). You will see a folder for source files and another for header files in the projects panel, but these don't map to any folder in your disk, so make sure you add header and source files to their appropriate directories whenever you create or add these files to your project. You know that in C, C++ and Java every program starts in main(), however, if you take a look at the source code of many wxWidgets applications, you won't find main(). This is not an obscure C++ hack, it's just a simple indirection, after all, nothing implies that you should always create your own main(). 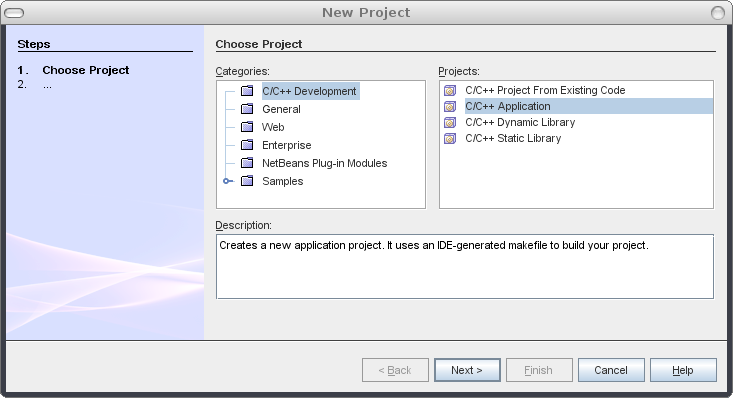 For example: a Java desktop framework may create its own main() and call an interface implemented by you during start-up. wxWidgets has a similar approach, although it still allows you to create your own main() if you will, though this is usually not recommended because it's less portable. This section will use the recommended way, though you can see how to use your own main() if you're interested. #include <wx/app.h> — to find out which header corresponds to which class, just check the "included files" section of the API doc of the class in question. If you are unsure of which class to pick, try picking a class by its category. You can also try using the generic <wx/wx.h> if you want to take advantage of precompiled headers or if you want to make your refactorings a little easier. You may download the source code of this section. 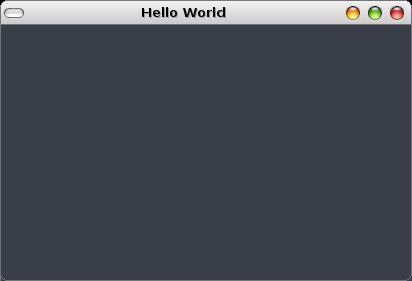 _T("Hello world") — you know it's just the window title, but note the _T() macro: you need it to convert your strings to unicode (in case you compile with unicode support). In the case you compile your program without unicode support, this macro is harmless, so you better always use it to avoid possible nightmares. wxSUNKEN_BORDER, wxRAISED_BORDER — most widgets in wxWidgets provide styling facilities on their constructors, many of which can be inherited from their parents. These border styles in particular were inherited from wxWindow. You can try variations with other widgets to see how they behave and what styles are available for them. You may download the source code of this section. The code in this section may not be very useful, but it's more than enough for you to start using sizers. 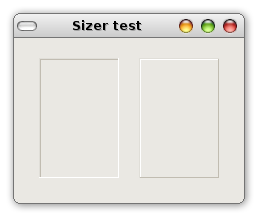 Note that the goal here is comprehension: once you get the idea of how the box sizer works in wxWidgets, you can do most of your layouts with simple compositions. Other methods of wxSizer are very similar to their equivalents in Swing and should pose no problems for you to understand. You may download the documented source code of this section. If you have ever written any sizeable Java desktop program, you have probably written tons of event handling classes. A Java class may contain dozens of inner classes piled over each other to handle events of an arbitrary number of components. While this may sound familiar to you, this style of event handling is still weird to many people. It may have been strange to you while you were learning Java, but at this stage of the game this is probably a long forgotten impression. Event handling in wxWidgets is something that will bring back that awkward feeling, but as soon as it pass it will look just as natural as event handling in AWT/Swing. Fig. 4. Swing and wxWidgets results, respectively. Note how both toolkits act differently with regard to centralization on the parent (the right button). event.GetEventObject() — the equivalent to EventObject's getSource(). 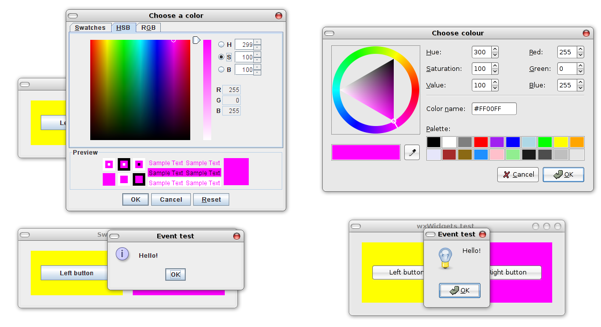 You may have noticed that the example contains other features of wxWidgets like a color chooser panel (the equivalent to JColorChooser) and a simple dialog message (the equivalent to JOptionPane). These are explained in more detail in the wxWidgets list of convenience dialog functions. Event tables are great because they are lean and save a lot of typing — but in contrast with what? The other way to handle events: Event's Connect()/Disconnect(). You may wonder why does anyone bother using it if event tables are so advantageous. There are three basic reasons: first, event tables use macros, and that doesn't fit everyone's taste; secondly, event tables do not allow event handling to take place in some other object; finally, event tables are static and do not allow event handlers to be defined at runtime (which is default in Java). With that in mind, one could say that Connect()/Disconnect() are in fact more familiar to a Swing programmer than event tables, and they don't just look familiar, they do allow you to do everything you do with listeners in Java. In spite of all this versatility and power, it eludes me that the official wxWidgets documentation reserves little room to explain the advantages of this style of event handling, even though the authors themselves have done so. Without further ado, let's see how it works. (cont.) wxMouseEventHandler(MyFrame::showMouseCoordinates) — the function that will handle the event, which has to follow all the rules for handler functions discussed on the previous section. The wxMouseEventHandler macro that encloses the function converts this function to the correct type that can handle this event. The rule is pretty simple: for a wxFooEvent you will handle, enclose the function on this argument with a wxFooEventHandler macro. While using Swing and wxWidgets it's difficult to refrain oneself from comparisons: Java's progress bar can be resized but wxWidgets' cannot, whereas the latter's color dialog has a color picker which the former has not, and so on. Despite the many bindings of wxWidgets, the choice of one over the other is often a choice between Java and C++, which is not always trivial. The objective of this comparative tutorial was not to provide an or, but an and to the toolkit that developers with a Java background have to solve problems. Once both toolkits are learned, the developer will have a choice and will be able to take advantage of the best that both toolkits have to offer. ©2005-2015 Dalton Filho. All Rights Reserved. • Design by Free CSS Templates and Dalton Filho • Icons by FAMFAMFAM and Everaldo.